Today is my Michael's birthday. (The first 30 candles are implied.) 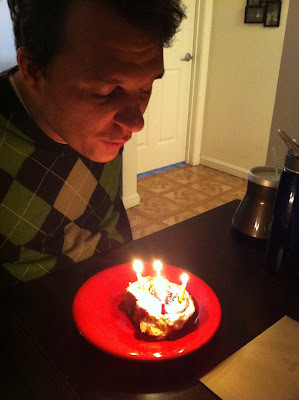 Cinnamon buns and birthday candles have become a tradition in our house for his birthday. I got the idea from seeing a friend's Facebook pictures a few years ago. It's a fun way to start the celebrations! This is our third set of birthdays since we got married, and it's a great feeling to feel like we are actually settling into our own traditions. I am so glad this guy was born. I am so glad he married me. And that on his birthday, I also get to enjoy birthday buns and cake. Michael, I love you even more than icing. I hope you enjoy every moment of your day. aw, how sweet. happy birthday, michael!